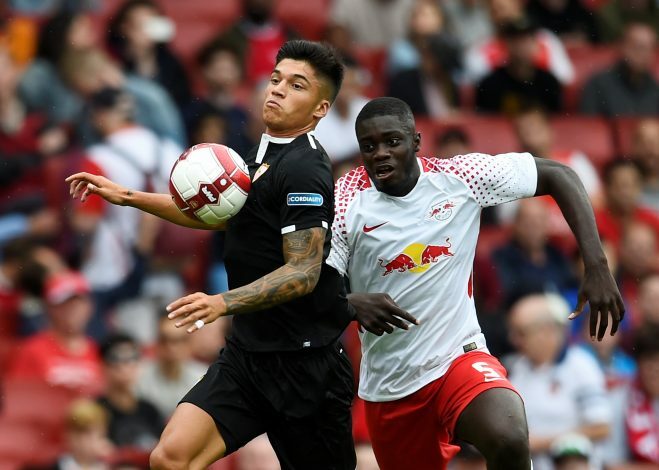 Manchester United have once again been linked with the signing of Dayot Upamecano, three years after a deal for the youngster fell through. United, under the tutelage of Louis van Gaal at the time, were eager to bring him to Old Trafford from Valenciennes in January 2015. Reports in France suggested that the deal for the then-16-year-old was all but done, but it wasn’t completed in time and ended up not happening at all. French news outlet La Voix Du Nord claimed a deal for the youngster worth around €450k with the potential to rise to about €900k was agreed. United were reportedly back in for him the following summer, but he ended up signing for RB Salzburg, and then in January 2017, moved to RB Leipzig. Now, three years on from the failed transfer, the defender’s price has risen by over 100 times the original amount he was linked for. Telefoot in France report that he is now worth €100m – a massive fee for a player who is only 19. Quoted by Telefoot, Upamecano explained: “When you’re young, you dream of Real Madrid, Barcelona, ​​Manchester United… But to get there, you have to work.